We are the otter creek aid society. Our village is located on Mt Desert Island, surrounded by Acadia National Park. To promote community life in the Village of Otter Creek through education and activities, to preserve and protect the historic Otter Creek Hall, and to perpetuate the history and cultural heritage of the village. To promote community life in the Village of Otter Creek, Maine through education and activities, to preserve and protect the historic Otter Creek Hall, and to perpetuate the history and cultural heritage of the village. Seeing a need in the community and joining together in action to fill the need. That is how the Aid Society of Otter Creek got its start over 100 years ago. Since then generations of residents, friends, and visitors have continued this tradition keeping alive the heritage of The Village of Otter Creek. The role of The Aid Society has increased through the years to include guardianship of the properties of The Hall, The former hall property, and Fish House Lot. The village is uniquely positioned. Need to maintain the integrity of village activity and ensure accessibility to all ages, interests, and opportunities. Many villages around us are looking for a way to balance the needs of year round residents, summer residents, and National Park visitors. These centrally located properties provide The Aid Society a unique opportunity to influence and shape the village. As a 501(c)3 nonprofit organization we rely on the contributions of the community to sustain our services. We are grateful to the many generous community contributors who over generations have dedicated their time, talents and financial support to make what we do possible. The Hall in Otter Creek is a historic hall maintained by the Otter Creek Aid Society. It is located on Route 3, 4.9 miles from the Village Green in Bar Harbor, Maine. From Bar Harbor, take Route 3 towards Northeast Harbor. The Hall is five miles out of town on the right. From Seal Harbor, take Route 3 towards Bar Harbor, The Hall is three miles on the left. Over the years The Hall in Otter Creek has been the foundation of community activity within the village. The Aid Society has held chowder suppers, tag sales, lecture series, artist workshops, annual Victorian Christmas celebrations, and much more. We continue to keep life in The Hall and community in our hearts. The Hall in Otter Creek may be reserved for private functions. Please use this form to inquire about availability. The Hall as viewed from the street. The Hall is brimming with potential. 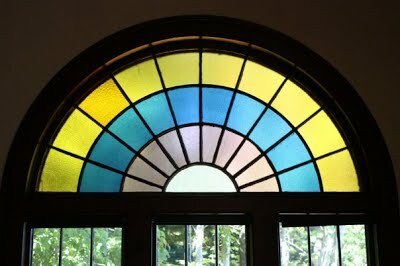 Stained glass windows make The Hall both vibrant and cozy.